Columbia rallied to edge Puerto Rico in five sets for fifth place, despite outside hitter Daly Santana’s 29 point effort. Meanwhile, Cuba’s Ailama Cese’s 31 points guided her team to seventh place at the Pan American Cup. Argentina edged Mexico in four sets for ninth place at the Pan American Cup, while Trinidad & Tobago rode star player Krystle Esdelle’s tournament high points haul to a sweep of Costa Rica to grab 11th place. 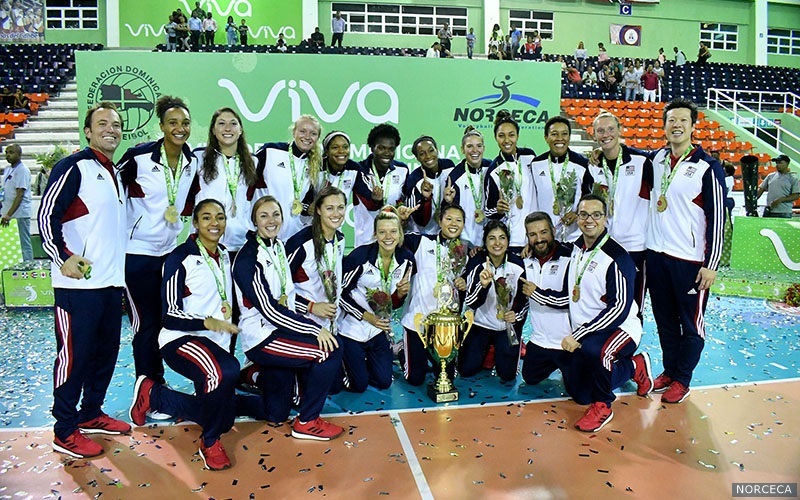 The United States won its second straight Pan American Cup title, outdoing the Dominican Republic for the second year in a row, rallying for a five-set win. Canada rounded out the podium with a sweep of Brazil on Saturday, picking up the country’s second Pan Am Cup medal in tournament history, following a bronze in 2002. After falling behind 2-0, the United States won three straight sets to claim a five-set win and the Pan American Cup gold medal on Saturday. Aiyana Abukusumo-Whitney posted a team-best 27 points (23 kills, 2 blocks, 2 aces) to pace the American effort. Chiaka Ogbogu led the team with seven blocks to go with her 14 putaways. Sarah Wilhite (15) and Haleigh Washington (14) also notched double-digit scoring efforts. Wilhite downed 12 kills and added two blocks and an ace, while Washington accounted for eight kills, five stuffs and an ace. Brayelin Martinez was the top scorer for the Dominicans with 21 points (19 kills, 2 blocks). Gaila Gonzalez Lopez added 12 kills and two blocks. Yonkaira Pena Isabel also turned in a double-digit scoring effort with nine putaways and a match-high four aces. Niverka Frica put up a team-best three blocks. Team USA led the Dominican Republic in kills (65-51) and blocks (17-10), but trailed its foes in aces (10-4). The Americans committed 28 errors to just 24 for the Dominicans. In Set 1, the Americans trailed 11-7 early, but grabbed a 19-18 edge before falling in extra points. Team USA turned a 9-4 deficit into a 12-all tie, but again found themselves falling short in the end, 25-21 in Set 2. The teams split the first 28 points of Set 3, before the Americans scored seven of the next nine points en route to a 25-21 win. The United States used a 12-3 run to build a nine-point lead at 14-5 midway through Set 4 before sending the match to a decisive fifth set with a 25-19 victory. Once in tiebreak, the USA jumped ahead 6-2 and held on for the 15-8 win and the event title. Ten aces, three from top scorer Kiera Van Ryk, helped lift Canada to a sweep of Brazil and the Pan Am Cup bronze medal. Van Ryk scored a match-high 18 points, with 13 kills, three aces and two blocks. Alexa Gray followed with 12 points, all on kills, while Autumn Bailey added five kills and three aces. Jennifer Cross joined Van Ryk with two stuffs. Bruna Marques was the top scorer for Brazil with 10 points on nine kills and an ace. Maira Cipriano Claro was next with six points on four putaways, a block and an ace. Five players added three points each to round out the scoring. Mara Ferreira Leao and Francynne Jacintho tallied two blocks apiece. Canada outdid Brazil in kills (40-25), blocks (6-5) and aces (10-2) to overcome 28 errors. Brazil limited its errors to 19 in the match.